Sony gave the world a glimpse at E3 back in June, and now it’s official. On November 6th, 2012, Sixense will launch Portal 2 In Motion, a motion DLC campaign for Valve’s Portal 2 on PlayStation Move. The development team at Sixense has applied some expertise in motion gaming to create what we believe will be the defining experience for PlayStation Move. It may even be the only experience for some users. The Portal 2 In Motion DLC will be priced at $9.99 on PSN. Sony will also have a special launch promotion of 30% off for PlayStation Plus members. 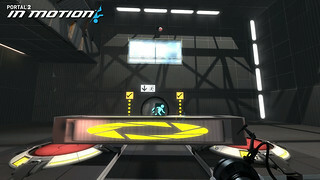 Portal 2 In Motion introduces gameplay mechanics, including scaling and rotation of objects as well as portal surfing. These new abilities are all required as the player progresses through an increasingly challenging set of test chambers that look familiar from Portal 2, but require new thinking to solve. Sony are timing the release of Portal 2 In Motion to coincide with Valve’s release of Portal 2 for digital download on PlayStation Network, which now includes PlayStation Move support for the entire single-player and cooperative campaigns. PS Plus members will also receive 30% off on Portal 2 when it launches on PSN. Owners of Portal 2 on Blu-Ray will receive PlayStation Move support through a free patch, which will provide a touch of the motion experience provided by Sixense. 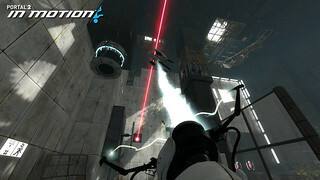 While the original Portal 2 campaigns will be fully playable with PlayStation Move, only Portal 2 In Motion features the gameplay mechanics designed by Sixense specifically for motion. Look for everything on November 6th.